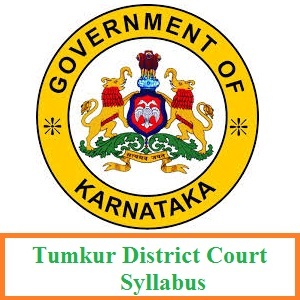 Complete information about the Tumkur District Court Syllabus 2019 is furnished on this single article. Those who have applied for the Tumkur District Court Recruitment must refer to this page to get all the detailed information of the detailed districts.ecourts.gov.in/tumakuru Exam Syllabus. Furthermore, the officials of the Tumkur District Court are ready to conduct the Stenographers, Typists, Peon, Process Server, Typist-Copyist Examination in March 2019. So, candidates must refer to the TDC Exam Pattern, the Tumkur District Court Selection Process from the below sections of this page. And to the end of this page, we have inserted the direct link to get the Tumkur District Court Exam Syllabus 2019 PDF. Well, the officials of the Tumkur District Court decided to hire candidates for the vacant Stenographers, Typists, Peon, Process Server, Typist-Copyist posts by the below given Tumkur District Court Selection Process 2019. We have gathered the correct TDC Exam Pattern 2019 from the official site. And all the information is kept in the below tabular form. So, candidates must and should hold the data present on it. And through this ತುಮಕೂರು ಜಿಲ್ಲಾ ನ್ಯಾಯಾಲಯ Test Pattern gives you with the name of the subjects, the maximum marks, the type and parts of the test paper. Each question carries one mark. And there are two sections or parts. They are Multiple Choice Questions, Conventional. There is no negative marking. 72 Questions will be given for the upcoming Stenographers, Typists, Peon, Process Server, Typist-Copyist test. Recently, the officials of the Tumkur District Court had announced and released the Recruitment Notification. And for that many of you have applied. So, those who have the eligibility to attend the Stenographers, Typists, Peon, Process Server, Typist-Copyist Test must check this page to find out the latest Tumkur District Court Exam Syllabus. Furthermore, you can even get the exact subject wise topics soon after this section. Are you the one who is searching for the Tumkur District Court Syllabus 2019? then, check here to move further for the preparation process. Also, candidates should have proper preparation for the examination. Remember, if you have the correct preparation, then you can easily score more marks in the TSC Exam 2019. So, look at the below listed topics and then download the Tumkur District Court Exam Syllabus 2019 in PDF format for free of cost. Hope all the candidates will start preparing for the Exam by downloading the Tumkur District Court Syllabus 2019 PDF from the above link. Furthermore, candidates can also get the direct and latest updates only from our website @ FreshersNow.Com.